Does this sound like you? If it does, guess what? Unless you live in a rain forest where the humidity is 100%, I would bet you dollars to donuts- that you applied too much wax! First- I would like to direct you to watch my video on how I apply Clear Wax. If you have never watched- you should. Think about what you may have done differently than I, based on my instructions. Watch that video by clicking HERE. So, if you have too much wax on your piece, first take a clean rag that has no residual wax on it from previous applications. Focus on that one area of your piece of furniture and rub it lightly for 20 seconds. Touch it. Has any of the tackiness disappeared? (I am hoping you said yes) Sometimes- that tackiness comes from not a thorough rub off. If this worked- you got lucky. NOTE- apply wax over the whole side or top…not just spot treat. But you do not need to wax the whole piece of furniture if you are having this issue only on the top. So, the next step is to try a rag with a little odorless mineral spirits on it and wipe off some of that wax build up. Your rag should be damp only, not dripping! I like to use “real” Mineral Spirits..meaning not the “green” Mineral Spirits that has a milky white appearance. I just don’t feel it works nearly as well as the original Mineral Spirits. Take your rag and place it on the opening of the Mineral Spirits. Flip the container a couple of times in different areas of the rag. (the image I want you to think of is how a person would put nailpolish remover onto a cotton swab or ball!) With a tiny bit of Mineral Spirits on your rag, rub the piece in the direction you applied the wax. (Meaning- do not going against the grain) This is particularly important with Dark Wax and where you applied it in strokes. The mineral spirits on the rag will remove some of the wax – but it won’t restore the piece as it was before you applied all of the Wax. You do not want to be aggressively scrubbing in any one spot- you want to have uniformed removal of the build up. After using Mineral Spirits- give your piece time to “air dry”…meaning allow the residual mineral spirits that may still be slightly on the piece to evaporate. Once the piece has no moisture to it, you can consider sanding some of the wax off. This can take a bit of time and be messy if the wax is on really thick. If after the Mineral Spirits step- your piece feels better…skip the sanding. Keep in mind- that if you do not like the look of it after this “corrective measures- with chalk paint, you can paint right over the wax and start again. However, if you just know that there is still quite a bit of fresh wax on the piece, Annie has recommended you give the wax ample time to cure. This could mean waiting about 4 weeks. Once you go to paint over the wax- there is no extra prep work needed. Just make sure the Wax has dried! You cannot repaint over freshly applied wax…clear or dark! That is like walking on quick sand- ..not a good thing. But let’s help you avoid this issue! Please read the following before using wax for the first time. How Much Wax Do I apply? If all you take away from what I say and do is this…you will be ok! So, please take note … we are not icing a cake! We are waxing furniture. So, VERY THIN & UNIFORM coats are best. Just like when you put moisturizer on your skin- you do not put a thick coat on, but rather a THIN coat and rub it in- so that it will be absorbed into your skin. OR when you use hair conditioner…you apply it and then do what? Rinse it off. That is because your hair will absorb what it needs. 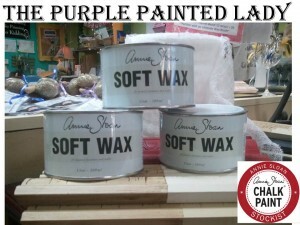 Annie’s Chalk Paint will do the same thing in regards to the wax! And you should never have so much wax on your brush that it is “caked” up the sides. If you have this- you are using too much wax and more importantly- wasting your wax. Also- you never apply the wax and then leave it that way- YOU ALWAYS REMOVE THE RESIDUAL and wipe off the extra. Never- ever apply wax and leave it for hours or days before doing this!!!!! NEVER! 2. I use my wax brush and pull some of the wax from the glob (for lack of better words.) Only the tips of your wax brush bristles should have wax on them- there should not be wax covering up the side of the brush. A little goes a long way! Again- you are not icing a cake where you want a generous amount of thickness. We are applying the wax very thin- pressing uniformly with steady pressure- but not so much that you are bending the bristles on the wax brush. I like to use the analogy that this is similar to waxing your car…you apply the wax- BUT NOT SO MUCH that when it is time to wipe it off or buff- you need a power tool to do it! So- apply a thin layer of wax and GET IT IN THE GROOVES OF THE PAINT. Again- another analogy is a Thomas’s English Muffin. Think if the wax being butter. You want the butter to get into all the nooks & crannies. Same concept for the wax in regards to the paint. 3. APPLY WAX IN SECTIONS: I work in about 1 foot sections … I use a circular motion when applying the Clear Wax. Sometimes- depending on the piece- (except when going for that Rustic look or when you have a textured piece) I will apply the wax in the same direction as my painted brush strokes. Either way…circular or not….when I have finished waxing a whole side of the piece – I ALWAYS finish with a few clean straight wipes with my rag in the direction I painted and I am pushing the wax in and wiping off the extra. If I was doing a dresser top- I would start at the back reaching across while standing in front of the piece and as I apply the Annie Sloan wax – I work my way toward the front as so I don’t lean into a previously waxed area. You will see where you waxed prior because it does deepen the hue of the paint a slight amount but be aware of where you just waxed. I also overlap my waxing sections so I ensure that I do not leave any missed spots. 4. WIPE OFF WAX: After applying the wax to one section, I will notice when the wax is not covering as much- that is my queue I need more wax. But before reloading your wax brush….use a lint free cotton t-shirt (an old one from my husband or an old sheet) and I wipe off the residual wax with a couple wipes ..circular or in the same direction as I just waxed. (I am not buffing the wax at this stage! Merely just removing or incorporating any small wax “crumbs” that may be present.) Again- a few uniformed swipes or circular rubbing (but more if necessary) – and that is it. 5. Resume waxing the next area- I wax strategically – meaning in an organized direction so I do not miss a spot. And I overlap my last “section” just a smidge so I don’t miss any of the surface. 6. The wax will dry (meaning no longer be tacky to the touch within a short time….maybe an hour or two?) However a variable in the dry time is the temperature and humidity where you are located. Is it is humid and cooler- cure time will be longer. If it is taking a long time and your wax is still tacky and you are not in the rain forest- reread my warnings above regarding applying the wax thin! “Do not “touch up” areas with paint once waxed- you either need to do the whole surface or don’t do it at all. Even if you rewax- spot painting always shows in certain lighting. 9. Surfaces that will get serious use (wear and tear) like tops of dressers and tables – should receive 2 to 3 coats of wax. If you are using Dark Wax, apply your clear wax coats first and let it thoroughly dry before doing a top layer of dark Wax! Follow the procedure above – always allow wax to dry between additional coats. Please watch my wax video! Visit my VIDEOS Page here to do so!